One of the best things about living in this day and age is the fact that we have advanced technology that helps ensure the good health of very young children. Fetal and infant mortality in past centuries was so high that there were dedicated infant cemeteries. Nowadays, though, science has come such a long way in helping to keep babies and mommies in great shape until delivery that mortality rates in very young children have dropped significantly, especially in rich countries. The easy availability of what once were deemed specialty tools, such as the best fetal Dopplers, is proof that we’ve really taken huge strides in improving the quality of life of women and their children. While conditions aren’t perfect, it’s something that we can now celebrate and take full advantage of to ensure that our families get ample and immediate medical attention, should they need it. A fetal Doppler alone can really make a massive difference in your pregnancy, making it a great device to have on hand. Here are a few of our top fetal Doppler picks that can help you monitor how your baby is doing around the clock. Are Fetal Dopplers Safe for Your Baby? 1. They can be a useful tool for those with high-risk pregnancies. 2. They can also cause anxiety to moms. 3. Accuracy can be an issue. 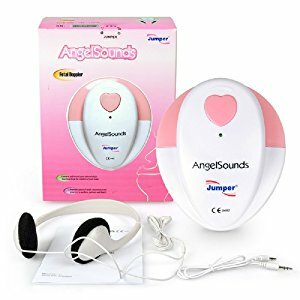 The Wusic Womb Music Heartbeat Baby Monitor is definitely one of the first products that other moms and experts will recommend to you. This highly rated device is best known for its ease of use and effectiveness. What's Great About It: What I like the most about the Wusic is its compact size. This is a small device that won’t take up too much space at home or require a special shelf when in use. All you have to do is to place the unit where you think your baby’s heart will be and put on the earphones that come with the unit. You can also record the baby’s heartbeat and then transfer it to your computer in a jiffy. Designed just like the Wusic, the Figerm Pocket Unborn Baby Sound Amplifier is an option worth looking into if you want something more affordable. 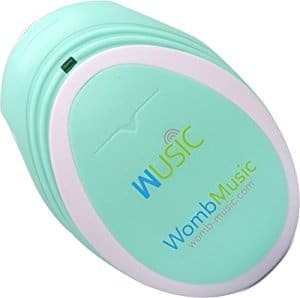 It has the same functionality as the Womb Music, as you only have a small device to send waves to find the heartbeat and a pair of headphones to listen to it. It’s also very easy to use, as the switch and controls are very easy to work with. The only downside is that it only comes with a single pair of headphones, so you might need to get another one if you want your partner to listen to the baby’s heartbeat, as well. What's Great About It: It’s very convenient to use. 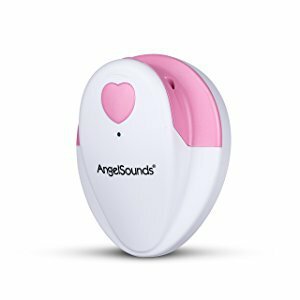 As it can also record the baby’s heartbeat, it comes with a cable that will let you connect the device to your computer for easy file transfers and sharing. I also adore its cute heart design, making it a thoughtful baby shower gift. BundleTumblle’s BabyBlip ensures that you will be able to distinguish the heartbeat from all other sounds that the body can make. It features an amplifier that enhances the sound of your baby’s heartbeat, hiccups, and more. What's Great About It: While this unit is recommended for fetuses that are 12 weeks and older, some owners say that they were able to hear their little one’s heartbeat as early as 7 weeks because of the crisp audio this fetal Doppler has. This makes it a fantastic option for many anxious first-time parents, as they can start monitoring their baby as early as possible. 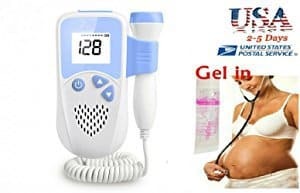 If you want a fetal Doppler that looks like a miniature version of your doctor’s ultrasound machine, then this Lansor product is for you. Unlike the other items in this list, it looks like an actual medical device with its separate probe and a handheld monitor, making you feel like a professional. What's Great About It: This product has more features than the other heartbeat monitors in the list. The LCD monitor displays the count of your baby’s heartbeat, giving you more information. It also has a built-in speaker, so that you can still easily listen to your baby’s heartbeat. An earphone jack is available, as well, if you want a closer listen to the sounds your little one is making. Another compact fetal Doppler is the Baby Smart Sounds Heartbeat Monitor. This one has the same design as the Wusic and Figerm products mentioned above and offers similar features and functionalities. It’s as easy to use and handle, and it's capable of recording your baby’s sounds. What's Great About It: What sets this product apart is actually its extras. Aside from the free ultrasound gel, it also comes with a free e-video that will walk you through the best spots to look for your baby’s heartbeat. It offers a quick guide of what positions fetuses assume at the different stages of pregnancy so you won’t have to spend a lot of time searching for a wonderful sound. Also referred to as Baby Heartbeat Monitors or Doppler fetal monitors, fetal Dopplers are basically ultrasound devices that are used to listen to a fetus’ heartbeat. Invented in 1958, these devices were initially available only for professional use, but in recent times, its popularity for personal use has significantly increased. This device is named after the main technology it uses to hear the fetal heartbeat, known as the Doppler effect. This creates an audible simulation of the sound made by the heartbeat, which is then amplified by the device so that you can hear it. Like when using an ultrasound machine, you’ll also want to use ultrasound gel to reduce static and get the best sound. Despite its popularity among expecting moms, there has actually been controversy about the use of fetal Dopplers. Some experts don’t recommend listening to your baby’s heartbeat at home, as there has been little research done one the effects of such devices on a child’s growth. Their accuracy is also deemed to be questionable by some doctors, as there are other sounds that the body can make. Determining which one is the heartbeat and which one is just gas moving in the stomach can be a challenge for the inexperienced, so it might just bring more confusion than help. However, because fetal dopplers are also widely used in hospitals without any significant damage to a lot of children, a lot of moms question the concerns expressed by some doctors. While their basis is purely anecdotal, as there have been no significant studies done about the device’s effects, completely banning the device seems to be unreasonable as well. The FDA also does not recommend getting ultrasound devices merely because of the lack of information on its effects to fetuses and because personal use isn’t subject to regulation and professional supervision. However, as they haven’t pulled the products off the shelves and because doctors still use them on a regular basis, you can rest assured that they’re not prohibited items. Some pregnancies are more delicate than others, which is why some parents want to have their own personal tools that they can use to monitor their little ones. A heartbeat monitor seems like one of the best ways to get this task done. While it is an amazing experience to hear your baby's heartbeat, it can really put you on edge every time you find it difficult to find a sound. The longer you have the unit with you, the more likely it will stress you out if you always have to struggle to find the heartbeat. Even though this is just normal, since fetuses move around in the womb, it can still cause unnecessary duress to a pregnant woman, making the ability to hear the baby’s heartbeat more of a burden than a blessing for some people. As mentioned above, it can be hard to detect the fetus’ heartbeat, especially if you’re not trained to find it. If you can ask your doctor for some tips in how to use your fetal Doppler, however, you might learn the basics of how to get the most out of these devices. You can also do some thorough research about the different positions babies take at different points of the pregnancy so you can always find the heartbeat in seconds. Make the pregnant woman lie down and remove anything that could be covering the abdomen. While you can also find the heartbeat while sitting up, first-timers may find it easier to locate the heartbeat when lying down. Apply a generous amount of ultrasound gel on the tummy and the fetal doppler probe. Locating the baby’s heart can depend on the stage of pregnancy. If you had an ultrasound done recently, use the image to determine your baby’s position inside your stomach. If you’re still at the early stages of your pregnancy, most experts recommend starting at the midline of the abdomen or just above the pubic line. Be patient. Finding a fetus’s heartbeat can be difficult, so listen carefully and don’t try to rush it. Avoid dragging the probe around, as it can increase the static, making it even harder to detect the heartbeat. You might also want to give this a try when your bladder is full, so that the sound can be further amplified inside your body. Despite the controversies that come with heartbeat-monitoring devices, you still can’t deny just how handy they can be for a lot of expecting parents. If you believe that you can benefit from owning one, you should seriously consider getting the best fetal Doppler available. Just make sure to arm yourself with the right amount of knowledge and your doctor’s advice so you can always guarantee the safety of both the mother and baby.